Egg frittatas are my answer to an easy, inexpensive meal solution whether I’m having it for breakfast, lunch or dinner. I made these with bell pepper and potato and served with a side of berries or fruit. For dinner, I serve with a salad on the side and call it a meal! You can literally throw anything into a frittata and call it a meal, but I thought it would be fun to make this one a St Patricks Day themed breakfast recipe which of coarse MUST have yukon gold potatoes, and to create a shamrock design, I sliced my bell peppers into flower shapes – completely optional! This one’s vegetarian, perfect if you need a meatless Monday dish idea, and it’s naturally gluten-free. More St Patricks day breakfast and snack ideas are a frothy Shamrock Shake, Rainbow Fruit Skewers with Yogurt Fruit Dip and Guacamole Deviled Eggs. 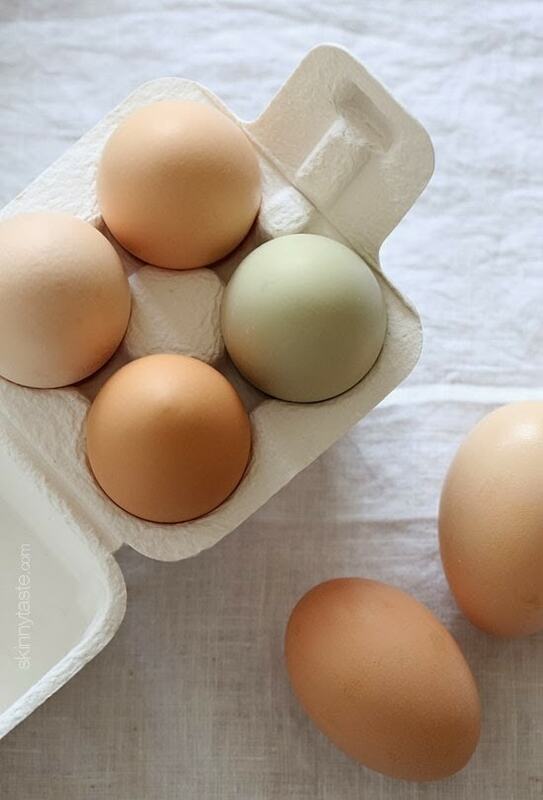 I’m not sure if there’s anything quite as beautiful as farm fresh eggs. A friend of mine is raising chickens in her yard and gave me some of her eggs and the colors were so beautiful I almost didn’t want to crack them. The yolks are so orange, it’s hard to believe I made this frittata with half egg whites. 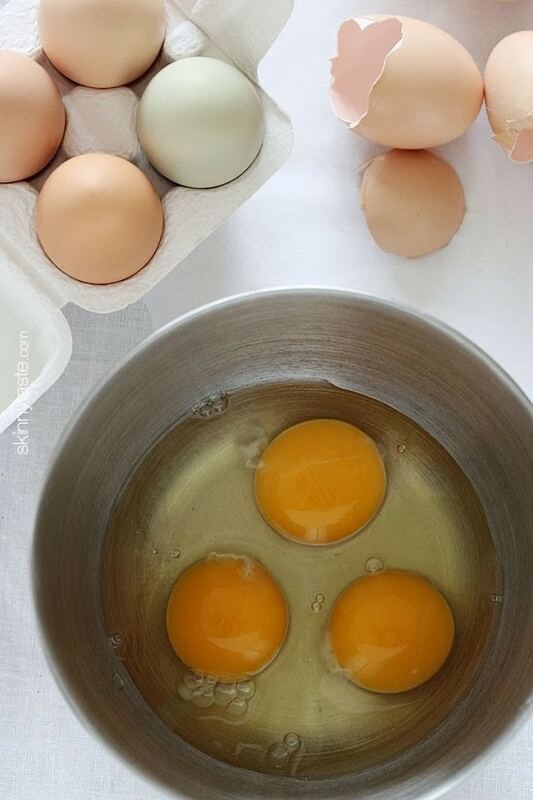 Crack the eggs and egg whites into a large bowl. Add salt and fresh cracked pepper and beat until blended. Heat a 10-inch nonstick oven safe skillet over medium heat. Add the oil and shallots to the pan and cook until golden, 2 to 3 minutes. Add the potatoes, season with salt, garlic powder, paprika and black pepper. 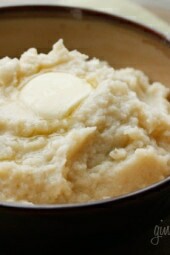 Cover and cook the potatoes over medium-low heat, stirring occasionally, until crisp and tender, about 12 to 15 minutes. Pour the egg mixture into the skillet. Carefully arrange the bell peppers on top to create a shamrock pattern if desired. Reduce the heat to low and cook until the edges are set, 6 to 8 minutes. Transfer the skillet to the oven and bake until the frittata is completely set and cooked through, 8 to 10 minutes. Remove from the oven and transfer onto a large plate. Cut into 4 wedges and serve. Hi Gina! How would you reheat this? I take breakfast & lunch to work, & only method of heating/reheating is via microwave. Haven’t had much success with reheating eggs; maybe used wrong power level? Anyway, scrambled eggs end up kind of bouncy. Any suggestions would be helpful! Do you cover it before you put it in the oven? Thanks for this festive St Patrick’s Day breakfast idea, Gina. I use My Fitness Pal app to journal my food log throughout the day and when I entered this URL into the journal, it registered as 256 calories per serving, not 144 calories as you have stated…..so who is correct? Personally, my husband and I do prefer good or scrambled eggs in lieu of frittata. Really watch MFP importing and actual ingredient counts. Especially things like garlic. Make sure totals by weight and calories match up. I am usually pretty close using exact ingredients. Delicious! Love all your recipes. Prepared for a lazy day breakfast. I will say that my peppers were a little on the thick cut side which left them crisp tender but in spite of me the frittata is very good. Not having shallots I opted to use sliced green onions. Thanks for another winning recipe. Very good and easy with little clean up.. I have heard of frittatas before but never knew what it was and I thought it might be hard to cook. We will be making this again. We had it for dinner. Thanks. A really good frittata! This was super easy to make and flavorful. I made this today with a twist or two. It’s sooooo good! Thanks for the recipe. What is the point of adding extra egg whites instead of the whole egg? You don't have to, but I do this to lighten it. I actually didn't think i'd like this because of the peppers but my husband wanted to try it. Wrong, its delicious! Will be having this once a week, thanks Gina. Could you cook it completely in the oven or is the stovetop stop a necessity? I'm also wondering if this could be frozen or reheated throughout the week. I made this for lunch yesterday and it was a huge hit! The seasonings and the way the potatoes were cooked made this recipe a real winner. I sautéed the bell peppers along with the onions. I cannot wait for lunch today – leftovers! This is perfection for St. Paddy's…definitely on theme! I realize it would no longer qualify as "Skinny"….but I am willing to bet the addition of bacon or ham and a hand toss of cheddar would take this above the clouds! Thanks as always Gina! Just made this today with sweet potatoes and red bell peppers. Delicious! What brand of pan did you use for this? I need to buy a new one. yummy, you can never go wrong with eggs and potatoes! The green peppers are perfect for St. Pattys day! How do you get your potatoes so golden brown with only 1 tsp of oil? I'm never successful at pan frying potatoes. I either burn them or under cook them. This looks delicious. Looks like you used a non stick skillet? Oven proof? So pretty, love what you did with the peppers!!! Happy March! Now if the snow would leave! Cute recipe! It sounds so tasty! Gosh, this is genius! I've never cut my peppers like that before — you're so clever! I'm gonna do this for Mother's Day brunch this weekend — red/orange/yellow bell pepper flowers and green pepper stems! Thanks for the pepper art idea! Just wanted to say "Thank You" for continuing to add "Old" point values, it is very helpful! Love your website, always check here first when I want to make something yummy without breaking the bank! Thanks! 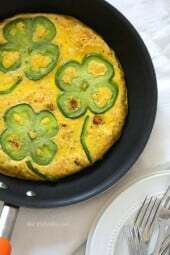 I make similar frittatas and tortillas, but I never thought of decorating one (or anything) for Saint Patrick's using bell peppers. Nice touch! This looks Ahhh-mazing! Can’t wait to try it. Also, your inspiration board is where I would like to live currently – hence the constant re-pinning! Love It. Never made a frittata before…but tried this last night for St Paddy's Day. Used 6 whole eggs (instead of the 4 whites) and added parsley to the egg mixture. My green-pepper "shamrocks" weren't perfect…but still easy to see what they were supposed to be. So easy and very delicious! Highly recommend! Made this tonight and it was delicious and easy! Thanks for sharing with us. oh, it's so cute.. great idea! I made this last week and it was easy, and tasty. The longest part was preparing the potatoes. I don't have an ovenproof skillet so I just put on a lid after I added the eggs and peppers. Leftovers were great, too. Great recipe. Tried it this morning. 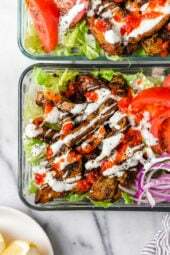 Am happy to have a quick meal idea good for any meal. Love this website! Do you think this could be made ahead and reheated the next day? Can you tell me how you would reheat? I’m notorious for meal prepping and then murdering it in the reheat lol! I appreciate you, Gina! This is such a cute idea! I saw it earlier on Pinterest and already pinned! Cant wait to make for my fam. I'm sorry, i'm confused. The recipe calls for 4 large eggs and 4 egg whites. Do you use any egg yolks? PS. I love your site! I tell everybody about it! Never mind, I think I figured it out: Use 4 large eggs + 4 more egg whites. This is why I need your website so much: I am not a cook! I don't have an oven safe skillet ,any ideas what to do? You could probably keep it covered on low, and maybe turn it towards the end to make sure it cooks even. You could transfer all of the other ingredients into a pie pan and then pour the eggs on top. Pop that into the oven! I need to us the pie pan method…praying that it doesn’t stick. HI there. 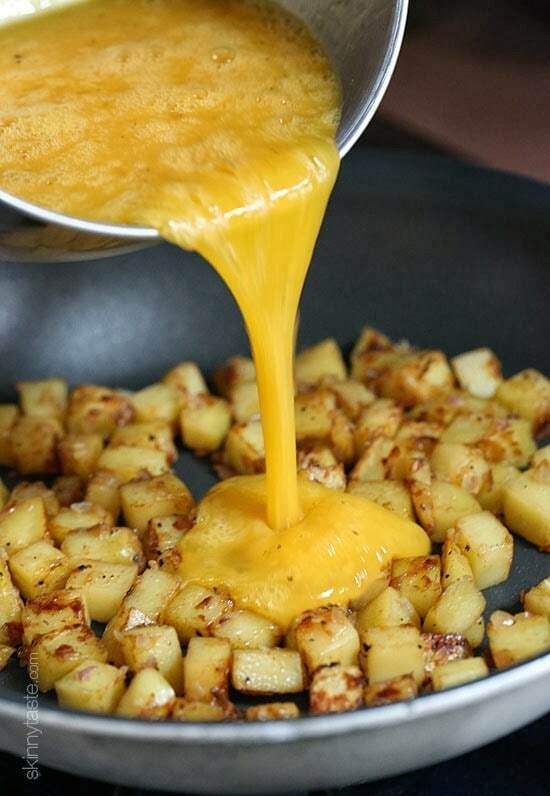 Once it cooks and starts tots to set, push back the edges gently wit a spatula to let some of the uncooked egg get underneath as much as possible Then cover with a lid or foil and cook until the top is no longer runny. I absolutely love this idea! So cute! I am with you on the frittata train, they are a great and inexpensive way to feed the family! Love your recipes! I don't know how you could bear to waste the yolks of those beautiful, farm fresh eggs! So I, too, hope you have an idea what to do with them. Thanks for the St. Pat's frittata idea! I couldn't either! SO I used the whites from some of the eggs in my fridge. 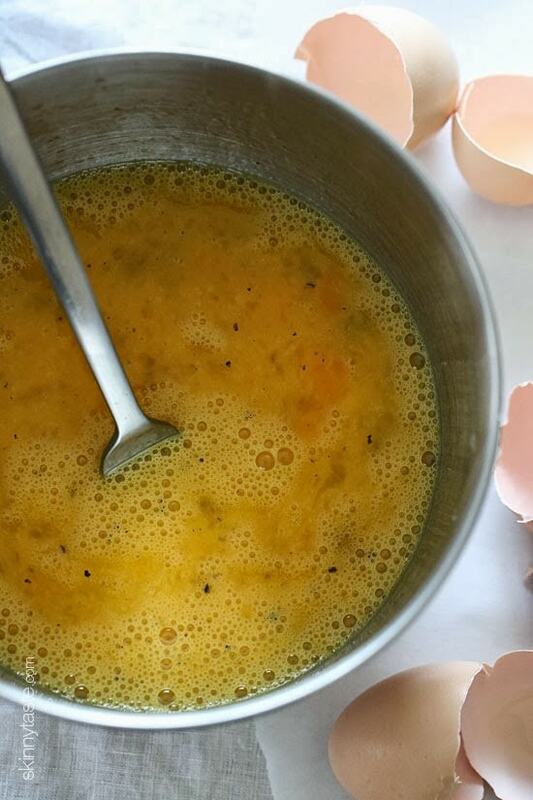 These fresh egg yolks are not to be wasted! I usually cook them for my dog. 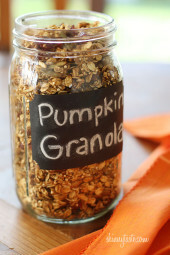 Wanna try this fab recipe! amazing! How pretty! It's actually Paleo, too, I think, if you use sweet potatoes or parsnips instead of the potatoes. Thanks so much for sharing! I love the peppers! So cute! Such a cute meal idea for St. Patrick's day! Love cheap, healthy recipes–thanks for sharing! Do you think this could work with sweet potatoes? It looks delicious. Your site is always so awesome. I love sweet potatoes in fritattas, I do it all the time. They would work great with this dish too – I like adding a little spice to counter the sweetness of the sweet potatoes. 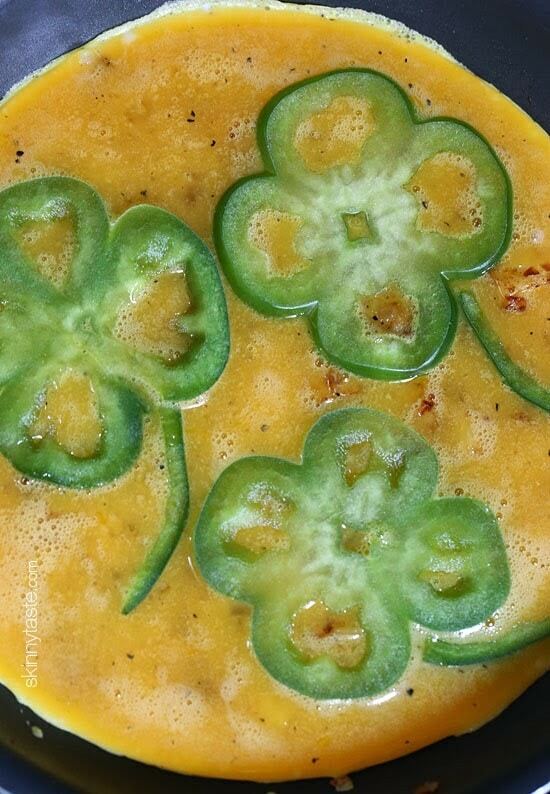 Fun St. Patrick's Day fritatta with the four-leaf clover bell peppers! I actually did the same thing for pizza toppings which I am sharing tomorrow.